JAKARTA (JAKARTA POST/ASIA NEWS NETWORK, AFP, NYTIMES) - Around 373 people were killed and more than 1,400 injured by high waves that struck coastal areas around Indonesia's Sunda Strait, between the islands of Sumatra and Java, last Saturday (Dec 22) night. As of Monday evening, the death toll reached 373, up from 222 the night before, while 1,459 people were injured and 128 were missing, according to Indonesia's disaster agency. The tsunami damaged or destroyed at least 681 homes, 69 hotels and villas, 60 small shops and 420 boats, said Dr Sutopo Purwo Nugroho, spokesman for National Disaster Mitigation Agency (BNPB). “The military and police are searching the ruins to see if we can find more victims,” said Mr Dody Ruswandi, a senior official at the disaster agency, adding that the rescue effort was likely to last a week. The rainy season could hamper rescue efforts. Indonesian President Joko Widodo arrived in Banten at around 9am on Monday and headed straight to the worst-hit Pandeglang regency. After arriving in Pandeglang in a military helicopter, he visited affected residents at makeshift health clinics. Less than three months after a quake-tsunami killed thousands of people around the city of Palu on Sulawesi island, waves as high as 3m hit the coast of southern Sumatra and the western tip of Java at around 9.30pm last Saturday. “The number of victims and damage will continue to rise,” said Dr Sutopo. Many of those killed were tourists, as the western coast of Banten is a popular tourist destination. A press statement issued by Singapore's Ministry of Foreign Affairs on Sunday (Dec 23) said that there were no reports of Singaporeans affected by the tsunami. Singapore Red Cross is pledging S$50,000 in humanitarian aid to support affected communities. The contribution will support disaster recovery efforts and fund the purchase and distribution of relief items - including water filtration systems, blankets, sleeping mats and household kits, said the agency in a press statement. The coastal areas most severely affected by the tsunami were Pandeglang regency, Serang, and South Lampung. 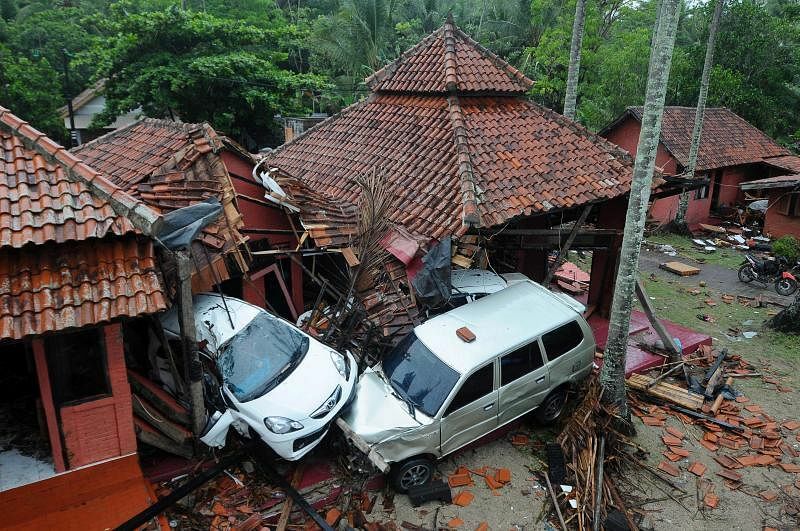 In Pandeglang regency, most casualties were reported at the Mutiara Carita Cottage Hotel, the Tanjung Lesung Hotel and Sambolo village. Indonesia's Coordinating Minister for Maritime Affairs Luhut B. Pandjaitan said tentative analysis from various institutions pointed out a flank collapse - the release of a large amount of materials in steep slopes because of tremors and high-intensity rainfalls - as the cause of the tsunami. This conclusion was based on seismographic data, tide gauge observation and satellite imagery, among others. High waves hit the coastal areas a little over 20 minutes after Anak Krakatau’s latest eruption on Saturday. Dr Sutopo said there had been no warning about the Sunda Strait tsunami because Indonesia did not yet have any early warning system for tsunamis caused by underwater landslides or volcanoes in the sea. The Meteorology, Climatology and Geophysics Agency (BMKG), the Geological Institute, the Agency for the Assessment and Application of Technology (BPPT) and the Ministry of Maritime Affairs are still continuing their investigation to confirm whether the tsunami had been caused by Anak Krakatau's volcanic activity. "This is because the activity (of the volcano) was relatively low yesterday. There was only a flow of magma and the hurling of incandescent rock, much smaller than the eruptions in October and November," Dr Sutopo said on Sunday (Dec 23). Anak Krakatau, which forms a small island in the Sunda Strait between Java and Sumatra, emerged around 1928 in the crater left by Krakatoa, whose massive eruption in 1883 killed at least 36,000 people and affected global weather patterns for years. “The likelihood of further tsunamis in the Sunda Strait will remain high while Anak Krakatau volcano is going through its current active phase because that might trigger further submarine landslides,” said Dr Richard Teeuw of the University of Portsmouth in England. Unlike those caused by earthquakes, which trigger alert systems, these tsunamis give the authorities very little time to warn residents of the impending threat. Volcano-related tsunamis are not uncommon. An eruption in 1792 in Japan created waves that were several hundred feet high. Landslides during the 1980 eruption of Mount St Helens in Washington spawned large waves in a lake nearby. Landslides hitting water can sometimes create huge waves. The largest wave ever recorded was caused by a landslide into Lituya Bay, in south-east Alaska, in July 1958. It followed an earthquake, not an eruption, but created a wave that wiped vegetation off the hillside on the opposite side of the bay. A United States Geological Survey geologist, measuring the scouring marks, determined that the height of the wave had been more than 518m.